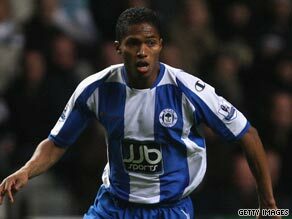 (CNN) -- Manchester United have made their first signing of the summer after confirming a deal has been done for Wigan Athletic winger Antonio Valencia. Ecuador winger Valencia moves to Manchester United as a replacement for Real Madrid-bound Cristiano Ronaldo. The 23-year-old Ecuador international has signed a four-year contract after moving for an undisclosed fee, believed to be in the region of £16 million ($23 million). Valencia is expected to help fill the void left by Cristiano Ronaldo following the Portuguese winger's impending 80 million euros ($130 million) move to Real Madrid. "Joining Manchester United is a dream come true for me," Valencia told the club's official Web site. "I have enjoyed my time at Wigan, but I am thrilled to have the chance to challenge for the biggest honors in club football here. "Playing in front of 76,000 fans alongside players like Wayne Rooney, Rio Ferdinand and Ryan Giggs will be an amazing experience. I can't wait to get started with the club. "I hope the fans at Wigan can understand that I am an ambitious guy and a chance like this might never come again for me," added Valencia, who will be 24 next month. "I am happy that the club has benefited from the move financially because I owe them such a lot. I have had a great time here." United manager Sir Alex Ferguson admitted he had tracked Valencia's progress since his arrival at Wigan two seasons ago. "Antonio is a player we have admired for some time now, having spent the last two years in the Premier League with Wigan," he said. "I am sure his pace and ability will make a significant contribution to the team." The first Ecuadorian to play for United will make his debut for the Premier League champions on a four-match tour of Asia next month, before the Red Devils head for a four-team tournament in Munich.